Was Obama’s “Prague agenda” ill conceived or were his efforts to implement it flawed? Various observers and historians will answer this question differently. Seven and a half years later, the UN General Assembly is poised to convene in early 2017 global negotiations on a treaty prohibiting nuclear weapons, a measure the Obama administration firmly rejects as impractical, even dangerous by undercutting nuclear deterrence. Soon, Obama will turn over to incoming President Donald Trump—a man he previously called unfit to be commander in chief—the launch codes for a nuclear arsenal that is only slightly smaller than the one he inherited eight years ago. As Obama took office in 2009, the threat of nuclear terrorism far overshadowed the possibility of nuclear war between Russia and the United States. In March 2009, U.S. Secretary of State Hillary Clinton and her Russian counterpart, Sergey Lavrov, symbolically pressed a “reset” button to mark a joint effort to improve relations that had suffered from the 2008 Russian military intervention in Georgia. Russia joined the United States in condemning North Korea’s second nuclear test in May 2009 and supported Obama’s planned nuclear security summit process. Obama and then-Russian President Dmitry Medvedev signed on April 8, 2010, the New Strategic Arms Reduction Treaty (New START), which mandates a modest reduction in nuclear forces by 2018. Iran announced in February 2009 that it successfully carried out its first satellite launch, raising international concerns that its ballistic missile potential was growing. Construction of Iran’s second, secret uranium-enrichment facility in the mountains near the holy city of Qom was discovered in September 2009.3 Preventing Iran from becoming a nuclear power became one of the most pressing nuclear challenges facing a new president. On September 24, 2009, Obama chaired the UN Security Council summit on nuclear nonproliferation and nuclear disarmament. The council unanimously adopted U.S.-sponsored Resolution 1887 calling for a world without nuclear weapons. In May 2010, a successful review of the nuclear Nonproliferation Treaty (NPT) was held at the United Nations that resulted in a consensus action plan to strengthen compliance with the treaty. Today, the world looks quite different. The threat of nuclear war between the United States and Russia or China, by mistake or miscalculation, has increased due to a general deterioration of relations and regional tensions over eastern Europe, Ukraine, Syria, and the South and East China seas. Russia dropped out of the nuclear security summit process in 2016, and Moscow and Washington have exchanged charges of violating the 1987 Intermediate-Range Nuclear Forces Treaty, which eliminated an entire class of nuclear weapons. Did Obama’s failure to achieve more of what became known as the “Prague agenda” indicate that the agenda itself was ill conceived or that his efforts to implement it were flawed? Various observers and historians will answer this question differently. Most of the elements of the Prague agenda enjoyed strong support across several post-Cold War administrations and from both major political parties. Those elements include reducing the sizes of nuclear arsenals, opposing the proliferation of nuclear weapons to additional countries, strengthening the security of nuclear weapons and materials to prevent their seizure or sabotage by hostile actors, and stopping illegal trade in nuclear materials and technology. This agenda continues to be seen as strongly in the national security interest of the United States and its allies. It was pursued by Democrat Clinton and by the two Bush presidents, both Republican, and likely will be pursued in some manner by the Trump administration and its successors. Obama did not err in seeking these objectives. 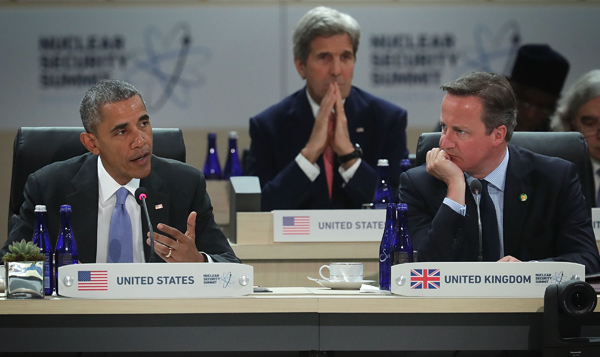 Three other elements of Obama’s nuclear agenda were more controversial. These include efforts to ratify the Comprehensive Test Ban Treaty (CTBT), to reduce the role of nuclear weapons in U.S. military strategy, and to seek the eventual elimination of nuclear weapons. Sufficient votes for Senate approval of the CTBT could not be found over the last eight years, and absent an effort by Trump to overcome Republican opposition, it is unlikely that the treaty will enter into force during his administration. Opponents believe that the United States must not be prevented from conducting underground nuclear test explosions if necessary to demonstrate the reliability of warheads in the U.S. stockpile. With respect to reducing the role of nuclear weapons in U.S. military strategy and to seeking the eventual elimination of nuclear weapons, the Obama presidency faced sharp domestic opposition that was strengthened by negative developments in the global security environment. In 2010 the administration conducted the Nuclear Posture Review (NPR) and issued a report articulating the roles and purposes of U.S. nuclear forces. The report asserted that one of the five objectives of U.S. nuclear strategy is to “reduce the role of U.S. nuclear weapons” in that strategy.11 One approach to this objective would be to narrow the range of threats that U.S. nuclear weapons are intended to deter and the circumstances under which the use of U.S. nuclear weapons would be considered. Specifically, the administration considered asserting that U.S. nuclear forces exist solely to deter nuclear attack against the United States and its allies and announcing that the United States would never be the first to use nuclear weapons in a conflict. These failures in large part can be attributed to a more assertive Russia, which has refused to be a partner in reducing the dangers of nuclear weapons. Russia is midway through a major modernization of its nuclear forces. It has objected to NATO enlargement and U.S. missile defenses in Europe. Russia’s 2014 invasion of Ukraine made any measure unilaterally to reduce U.S. nuclear forces or even its stated reliance on nuclear weapons politically impossible. In a similar manner, China’s continued modernization and gradual enlargement of its comparatively small nuclear arsenal and its island building in the South China Sea spike any U.S. moves to de-emphasize its nuclear might. The deterioration of relations with Russia and China cannot be blamed on Obama’s administration, which made heroic efforts to engage both nations in strategic dialogue and tension reduction. 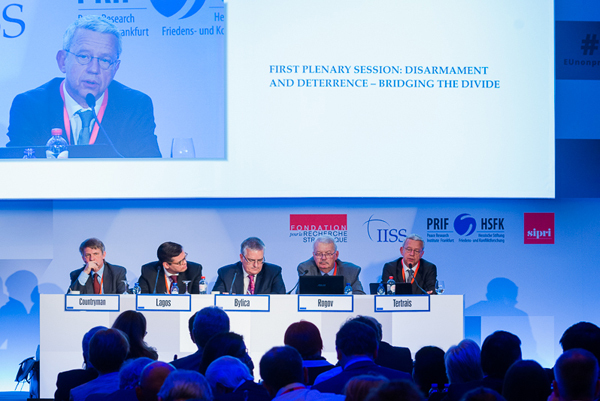 Russia, in particular, has re-emphasized the role that its nuclear weapons might play in a European conflict and has conducted a series of exercises and deployments that feature the simulated use of nuclear weapons. Trump will inherit the nuclear weapons issues that challenged the Obama presidency. He has not clearly indicated what stance he will take toward the role of nuclear weapons in U.S. policy nor whether he believes that the country should work toward their elimination. Meanwhile, the influence from the campaign to negotiate a treaty banning nuclear weapons, new Catholic teachings on nuclear weapons, and the expanding grassroots Global Zero campaign is poised to grow and advance. Whatever policies the Trump administration pursues will face a growing movement spurred in part by the visionary path that Obama set out in Prague. 1. 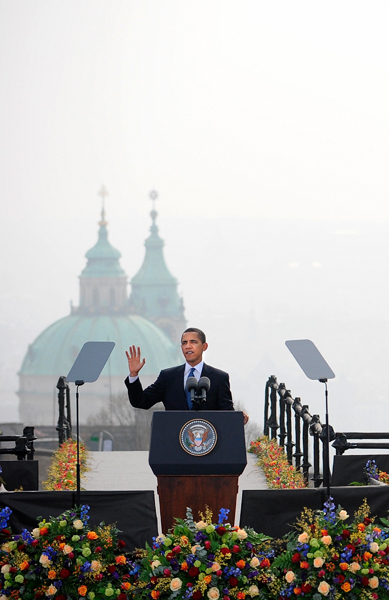 Office of the Press Secretary, The White House, “Remarks by President Barack Obama—Hradcany Square, Prague, Czech Republic,” April 5, 2009, http://www.whitehouse.gov/the_press_office/Remarks-By-President-Barack-Obama-In-Prague-As-Delivered. 2. Arms Control Association, “Nuclear Weapons: Who Has What at a Glance,” October 2016, https://www.armscontrol.org/factsheets/Nuclearweaponswhohaswhat. 3. Arms Control Association, “Timeline of Nuclear Diplomacy With Iran,” August 2016, https://www.armscontrol.org/factsheet/Timeline-of-Nuclear-Diplomacy-With-Iran#2009. 4. Katie Hunt, K.J. Kwon, and Jason Hanna, “North Korea Claims Successful Test of Nuclear Warhead,” CNN.com, September 10, 2016, http://www.cnn.com/2016/09/08/asia/north-korea-seismic-activity/. 5. Office of the Spokesman, U.S. Department of State, “New START Treaty Entry Into Force,” February 5, 2011, http://www.state.gov/r/pa/prs/ps/2011/02/156037.htm. 6. U.S. Department of Defense, “Stockpile Numbers: End of Fiscal Years 1962-2015,” n.d., http://open.defense.gov/Portals/23/Documents/frddwg/2015_Tables_UNCLASS.pdf. 7. Hans M. Kristensen, “U.S. Nuclear Stockpile Numbers Published Enroute to Hiroshima,” Federation of American Scientists, May 26, 2016, http://fas.org/blogs/security/2016/05/hiroshima-stockpile/. 8. Arms Control Association, “U.S. Nuclear Modernization Programs,” October 2016, https://www.armscontrol.org/factsheets/USNuclearModernization. 9. U.S. Department of State, “Joint Comprehensive Plan of Action,” n.d., http://www.state.gov/e/eb/tfs/spi/iran/jcpoa/. 10. Yeganeh Torbati, “Trump Election Puts Iran Nuclear Deal on Shaky Ground,” Reuters, November 9, 2016. 11. U.S. Department of Defense, “Nuclear Posture Review Report,” April 2010, http://www.defense.gov/Portals/1/features/defenseReviews/NPR/2010_Nuclear_Posture_Review_Report.pdf. 12. David E. Sanger and William J. Broad, “Obama Unlikely to Vow No First Use of Nuclear Weapons,” The New York Times, September 5, 2016. 13. Office of the Press Secretary, The White House, “Fact Sheet: Nuclear Weapons Employment Strategy of the United States,” June 19, 2013, https://www.whitehouse.gov/the-press-office/2013/06/19/fact-sheet-nuclear-weapons-employment-strategy-united-states. James E. Doyle is an independent nuclear security specialist. He was a technical staff member at Los Alamos National Laboratory from 1997 to 2014. North Korea is the biggest blemish on President Barack Obama’s nonproliferation record. North Korea is the biggest blemish on President Barack Obama’s nonproliferation record. 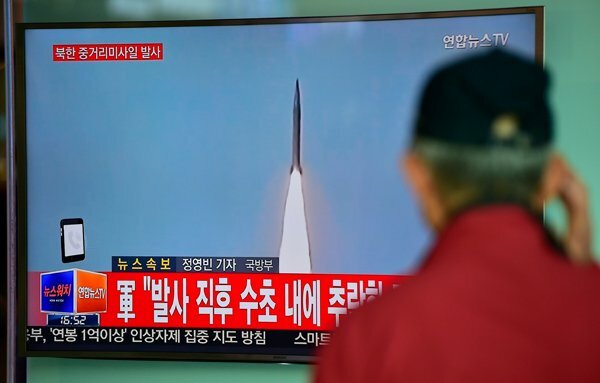 Pyongyang’s four nuclear tests and more than 50 missile and rocket launches during the past eight years have given it a capacity to rain nuclear warheads on its regional adversaries and a good start to be able soon to reach the U.S. homeland. Early in Obama’s term of office, North Korea displayed a uranium-enrichment program to complement its plutonium production. For ways to deliver nuclear weapons, it successfully tested submarine-launched systems; intermediate-range, road-mobile Musudan missiles; and satellite-launch rockets that employ technologies useful for intercontinental-range missiles. Nuclear armament became etched in the country’s constitution and posture. 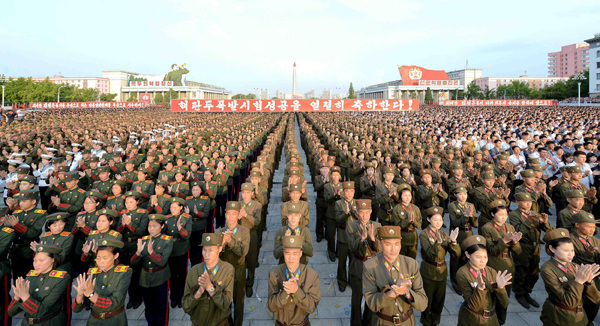 Pyongyang now insists it will never give up its nuclear-armed status. The six-party talks that once showed promise of a path to dismantling the nuclear program are dead, the parties not having met since before Obama took office. A failed North Korea policy is not unique to Obama. His predecessor, President George W. Bush, saw arguably worse breakthroughs by Pyongyang, with a quadrupling of separated plutonium holdings and its first nuclear test. North Korea fixed its nuclear path well before Obama’s presidency and met his offer of an open hand with a three-stage rocket launch and nuclear test within his first four months in office. Obama’s commendable effort to halt the strategic weapons development, via the 2012 Leap Day deal that promised a moratorium on nuclear and missile tests as well as enrichment, was a bust. Within a few weeks, the North’s new young leader, Kim Jong Un, ordered the testing of a space rocket as his diplomats improbably claimed that this was not covered by the agreement. Kim’s duplicity sapped Obama’s will to risk any more political capital on engagement, although there were some quiet efforts that went unrequited. The administration no longer uses the term “strategic patience,” but it is an apt moniker for a policy of holding to the demand that North Korea return to the goal of denuclearization as a condition for talks. Instead, the Obama team loaded its eggs in the sanctions basket, finally this year ratcheting the pressure up to the level of the biting penalties that had been imposed on Iran. It is too early to judge these sanctions a failure. In Iran’s case, harsh sanctions were in place for a year and a half before Tehran agreed to serious negotiations. It will likely take longer for North Korea, given its greater insularity and Chinese lifeline. Would that the tough measures had been imposed earlier. The Obama team can boast success in maintaining an international consensus in dealing with North Korea. Unlike under the previous administration, Seoul and Tokyo have seen eye to eye with Washington on the issue. Peace on the Korean peninsula has been preserved, as has UN Security Council unity, with China and Russia reluctantly agreeing to the tougher sanctions. Spotty Chinese implementation has improved. This autumn, the United States adeptly coordinated secondary sanctions on Dandong Hongxiang Industrial Development Company Ltd., a major Chinese supplier to North Korea. Beijing itself targeted the firm with a criminal investigation. If President Donald Trump is able to roll back North Korea’s nuclear program, it will be due in part to the groundwork Obama laid. Alternatively, if the threat increases, the blame will be shared by successive administrations. The North Korean case may prove the adage that if a country is absolutely determined to acquire nuclear weapons, it will. Whether it will be allowed to keep them will be the test for the incoming administration. Mark Fitzpatrick is executive director of International Institute for Strategic Studies-Americas, and head of the IISS Non-Proliferation and Nuclear Policy Programme. With the 2015 Iran nuclear deal, Obama ensured Iran would not go nuclear and also set diplomacy and dialogue as his administration's main foreign policy goals. It was President Barack Obama’s 2009 Prague speech that set the tone for his utopian vision of a world without nuclear weapons. As part of this vision, he sought to ensure that Iran would not go nuclear. Obama also set diplomacy and dialogue as his administration’s main foreign policy tools. With the 2015 Iran nuclear deal, he accomplished both aims. Today, the Joint Comprehensive Plan of Action curbs Iran’s nuclear program and prevents it from dashing for the bomb. In his Prague speech, Obama declared that his administration would use dialogue “based on mutual interests and mutual respect” to prevent a nuclear-armed Iran. The 2010 U.S. Nuclear Posture Review reiterated that bolstering the global nuclear nonproliferation regime and curbing Iran’s nuclear ambitions were at the top of his administration’s agenda. Obama’s first major milestone toward that end was to open direct talks between Iranian and U.S. officials in Oman. Supreme Leader Ayatollah Ali Khamenei agreed to the talks in 2011, but it was only in 2013 that they began to gain traction, with reportedly nine or 10 secret meetings between March and November 2013. This initiative made dialogue between Iran and the United States the norm rather than the exception. The Obama administration also recognized the state of affairs: Iran had an extensive uranium-enrichment program that it would not simply give up. Tehran did not want a deal badly enough for that. In a push to find mutually acceptable grounds for a deal, U.S. officials explored whether acceptance of limited enrichment on Iranian soil would persuade Iran to address the desires of the United States and its P5+1 negotiating partners (China, France, Germany, Russia, and the United Kingdom) for an accord that blocks all Iranian pathways to the bomb. This made negotiations on a final agreement possible. 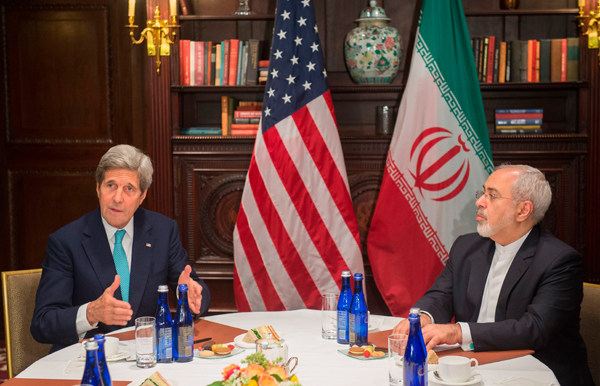 Unilateral and multilateral sanctions were intended to punish Iran for its activities. Yet, the Obama administration began to view sanctions as a negotiating tool rather than an end unto itself. In other words, the U.S. administration earnestly explored using the threat of further sanctions and, perhaps more importantly, the carrot of sanctions relief as a bargaining tool to win Iranian concessions. Although the United States was still severely constrained because of the need for congressional approval to remove existing sanctions, this change in approach allowed the P5+1 to get greater concessions from Iran on its nuclear program. Another noteworthy achievement of the Obama administration is the building of a working relationship on multiple levels, including the highest levels of government, after 35 years without dialogue between the United States and Iran. U.S. officials leveraged this channel to diffuse non-nuclear crises. In January 2016, the Iranian Revolutionary Guards navy seized two U.S. Navy patrol boats as they entered Iranian territorial waters in the Persian Gulf. The new direct channel between the United States and Iran allowed Secretary of State John Kerry to call Foreign Minister Mohammad Javad Zarif directly in order to swiftly negotiate the sailors’ release. Channels between the United States and Iranian security organizations allowed both countries to successfully negotiate a prisoner swap, which saw Iran release four American-Iranian prisoners, including Washington Post reporter Jason Rezaian. The nuclear agreement ensures that Iran’s potential pathways to the bomb are effectively blocked and its nuclear program is subject to the most intrusive verification measures to date. It was a success for dialogue and diplomacy. Yet with the victory of President-elect Donald Trump, who campaigned on a pledge to scrap what he labeled a “disastrous deal,” the durability of Obama’s most significant nonproliferation accomplishment is potentially at risk. Dina Esfandiary is a MacArthur Fellow at the Centre for Science and Security Studies at King’s College London. When Russian troops intervened in Crimea in 2014 and sparked a crisis over Ukraine, global tensions spiked. Thanks to the nuclear security summit process initiated by President Barack Obama, there was at least one worry that no longer troubled White House officials: the presence of highly enriched uranium (HEU) in Ukraine that might have given leaders in Kiev a nuclear weapons option. Since the breakup of the Soviet Union, the United States had been seeking to remove 234 kilograms of HEU, enough for several weapons, from Ukraine’s former Soviet research reactors. Yet, nearly two decades of efforts had failed to break through political obstacles in Kiev. When Washington conditioned Ukraine’s participation in the nuclear security summits on taking action, the final hurdles came down. The last HEU was transferred from Ukraine to Russia, where it was due to be down-blended into low-enriched uranium, by the time of the second nuclear security summit, held in 2012 in Seoul. The Ukraine case offers a vivid example of the gains of the summits, the venue for the president’s most significant nuclear materials control accomplishments and an outgrowth of his 2009 Prague speech putting forward nonproliferation goals that included organizing international efforts to secure vulnerable nuclear material. The summits successfully leveraged the desire of foreign leaders for good relations with Obama and the United States to break down some long-standing political barriers to nuclear security. In addition to Ukraine, more than a dozen other countries have given up HEU since the summit process began. In addition, other measures to improve nuclear security cooperation advanced. Most notably, shortly after the summit process wrapped up this year, an important amendment to the Convention on the Physical Protection of Nuclear Materials (CPPNM) finally entered into force. It requires states-parties to take steps to protect nuclear facilities and materials on their territory. This was buttressed at the 2014 summit in The Hague by a joint commitment by some three dozen states to have in place regulations that are at least as good as the detailed voluntary International Atomic Energy Agency (IAEA) guidance and to invite the IAEA to review these regulations. Still, the format and nature of the summit process, which brought together countries to make mostly voluntary commitments, failed to repair many of the long-standing weaknesses in global nuclear security. Despite meetings involving more than 50 world leaders, the legal regime remains quite weak in its rigor and in the materials to which it applies. For example, the summit focused on civilian materials although more than 80 percent of weapons-usable uranium and plutonium are in noncivilian hands. Furthermore, radiological materials, which are highly vulnerable to terrorists’ theft because of their wide use in hospitals, industry, and universities, received short shrift and are not covered under even weak legal measures like the CPPNM. Those materials could be used to make a “dirty bomb” that at a minimum would cause panic and perhaps large economic losses. In addition, because of the power of reprocessing industries in countries such as France, the summits did not even attempt to tackle the growing stockpiles of civil-sector separated plutonium. The summit process also did not fully succeed in building sufficient institutional mechanisms to sustain its gains. The formal attempt at doing so was a series of five vague action plans ostensibly aimed at pushing countries to help institutions such as the IAEA and the Global Initiative to Combat Nuclear Terrorism to hold exercises and other practical actions but committing them to do very little. More hopefully, some of the summit countries have formed a contact group aimed at sustaining progress in these forums; and additional countries, most notably China and India, have signed up to the 2014 commitment on the IAEA guidance on nuclear security. Making these a success will require President Donald Trump to spend political capital to sustain and extend Obama’s initiatives. Miles Pomper is a senior fellow at the James Martin Center for Nonproliferation Studies and a former editor-in-chief of Arms Control Today. The legacy of the Obama years may not be clear for some time. President Barack Obama came into office determined to bring new energy to nuclear and biological threat reduction and nonproliferation efforts. In rapid succession, his 2009 Prague speech, the nuclear security summit process he started in 2010, and the 2009 National Strategy for Countering Biological Threats sparked hope for reducing threats from weapons of mass destruction (WMD). Yet, chemical weapons, the junior member of the WMD triumvirate, scored nary a mention in the administration’s early days, except as chemical weapons demilitarization lagged behind U.S. commitments under the Chemical Weapons Convention (CWC). The chemical weapons challenge forced itself onto the president’s agenda in 2011 as NATO launched air strikes against the military forces of Libyan dictator Moammar Gaddafi and experts worried that his regime’s hundreds of metric tons of mustard agent and chemical weapons precursors, which were awaiting destruction, could fall into the wrong hands. Those concerns grew following , including 517 chemically filled artillery shells, eight 250-kilogram bombs, and 45 tubes filled with degrading mustard agent. To little fanfare, the remaining stockpile of weapons and materials was destroyed by mid-2014, thanks to an enormous effort from many across the U.S. government and international community who worked quietly and behind the scenes at record speed with a barely functioning Libyan government and amid deteriorating security conditions. Throughout 2015, as security concerns in Libya mounted and the Islamic State group’s interest in chemical agents became apparent, the international community again stepped in, passing a UN Security Council resolution that assembled a coalition to remove and destroy the last 500 metric tons of chemical precursors that remained in Libya. If Libya can be considered a success for Obama’s chemical weapons legacy, the broader picture, especially in Syria, is far more mixed. Although Syrian President Bashar al-Assad’s chemical stocks seemed relatively secure, low-level attacks with chemical weapons persisted throughout 2013, escalating to the August 21 sarin attacks near Damascus that killed an estimated 1,300 civilians, more than 400 of them children. This attack is the deadliest confirmed chemical weapons use against civilians since the 1988 Halabja massacre in Iraq by dictator Saddam Hussein. It brought the United States to the brink of military intervention and prompted a U.S.-Russian accord to remove and destroy Syrian chemical weapons capabilities. Execution of this agreement by the United Nations, the Organisation for the Prohibition of Chemical Weapons (OPCW), and several nations showed creativity, flexibility, and courage in eliminating the vast majority of one of the largest known active chemical weapons programs. Unlike Libya, however, Syria relinquished its chemical weapons program under coercion. Syria’s superficial commitment to the CWC and its accompanying obligations has led to uneven implementation, declarations less than fully forthcoming, and obstructionist behavior. Chemicals, including chlorine, have been used repeatedly over the last three years, driving home the sad reality that although these weapons have limited military utility, they are cheap and effective weapons of terror against unprotected populations. Reports of Islamic State use of mustard-like blister agents in Iraq and Syria further emphasize that the taboos and norms against the proliferation and use of chemical weapons are under profound pressure. The UN and OPCW deserve credit for establishing, at the urging of the United States and other like-minded nations, the OPCW fact-finding mission and the Joint Investigative Mechanism (JIM), two innovative approaches to unprecedented challenges in a politically fraught environment. The JIM completed its initial investigation and assigned blame for three chlorine cases to Syrian regime military forces and one blister agent case to Islamic State fighters. Accountability and consequences, which lie at the heart of deterrence, rest with the UN Security Council, but the next steps remain unclear. Moreover, the credibility of the nonproliferation regime as a system of laws cannot survive without enforcement in the face of blatant noncompliance. Holding perpetrators responsible is essential to turn the tide and prevent a growing normalization of chemical weapons use in the Middle East and beyond. Today, this crisis of confidence may be confined to the chemical weapons arena; but can the biological, radiological, and possibly even nuclear arenas be immune in the face of continued inaction? Hence, the legacy of the Obama years may not be clear for some time. Rebecca Hersman is director of the Project on Nuclear Issues and senior adviser for the International Security Program at the Center for Strategic and International Studies. Obama’s presidency has been marked by a limited focus on conventional weapons issues. When Senator Barack Obama (D-Ill.) was elected president in 2008, he had already demonstrated leadership in trying to curtail conventional arms proliferation. As a senator, he had sought to treat the dangers of conventional arms in a similar vein as nuclear weapons by joining Senator Richard Lugar (R-Ind.) in authoring the Cooperative Proliferation Detection, Interdiction Assistance, and Conventional Threat Reduction Act. The bill, signed into law in January 2007, provided funding to prevent the proliferation of conventional weapons and to help U.S. allies detect and interdict proliferated weapons. 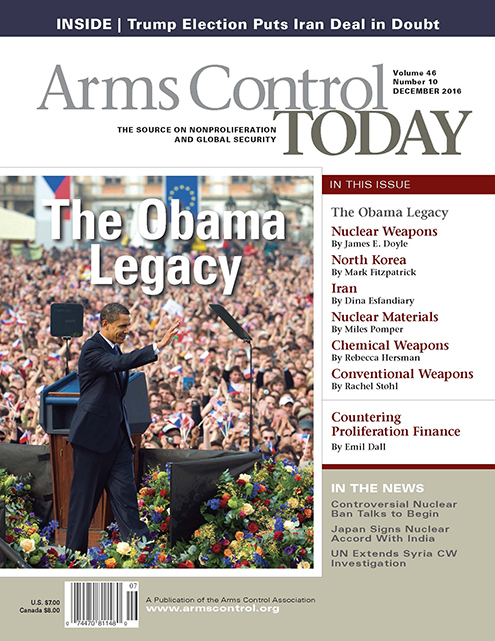 While the Lugar-Obama initiative represented an uncommon and important emphasis on reducing the risks posed by conventional arms, Obama’s presidency has been marked by a limited focus on conventional weapons issues. Certainly, there have been some noteworthy and beneficial steps. For example, during Obama’s two terms, the United States signed the landmark Arms Trade Treaty, released a new conventional arms transfer policy for the first time in 20 years, developed a new unmanned aerial vehicle export policy, and moved closer to joining the Mine Ban Treaty. Yet, the Obama administration’s overall record on conventional weapons issues is disappointing in a number of respects. The administration has a troubling record with regard to arms sales to countries with significant history of human rights abuses, including the use of child soldiers; with regard to transparency and accountability for the U.S. drone program; and as it pertains to the U.S. status in the community of nations banning indiscriminate and deadly anti-personnel landmines and cluster munitions. Indeed, the eight years of the Obama administration saw the highest value of foreign military sales agreements since World War II. From 2009 to 2015, these agreements totaled approximately $245 billion, compared to an estimated $127 billion from 2001 to 2008 under President George W. Bush. The quantity of weapons sold is less concerning, however, than the recipients of these weapons. Throughout the Obama administration, the United States has provided arms to countries with controversial human rights records, such as Bahrain, Egypt, Saudi Arabia, and more recently the Philippines. The Obama administration has approved arms sales to the most violent offenders—think Saudi Arabia’s campaign in Yemen or President Rodrigo Duterte’s most recent crackdown in the Philippines—stopping only when Congress has interceded or raised uncomfortable questions. In short, the Obama administration’s legacy on arms sales reflects a strong emphasis on sweeping national security concerns, such as counterterrorism priorities, at the expense of broader foreign policy values and interests, such as promoting human rights and supporting democratization and good governance. One of Obama’s more disappointing legacies has been his record on stopping military assistance and arms sales to governments using or recruiting child soldiers. 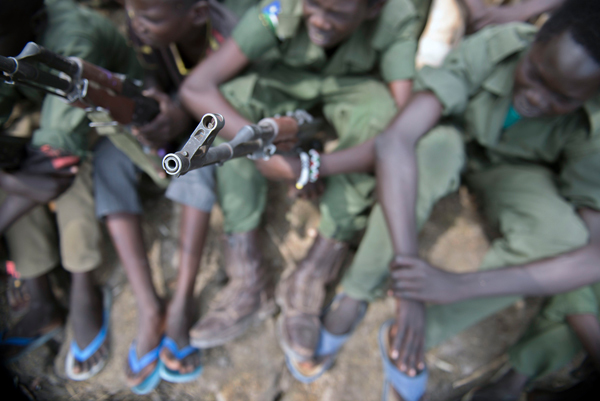 The 2008 Child Soldiers Prevention Act, which took effect in 2010, aims to leverage coveted U.S. military assistance to pressure governments to stop using children in combat. The law prohibits U.S. military assistance or arms sales to governments that use children in their national militaries or government-supported armed groups, although the restrictions can be waived if the president finds it is in the “national interest” to do so. In the last six years, the administration used these waivers to allow more than $1.2 billion in military assistance and arms sales, while withholding approximately $60 million, or less than 5 percent of assistance otherwise subject to the law. For six years, the Obama administration has sent the wrong message to governments that recruit and use child soldiers that there are no consequences for their continued recruitment and use of children in combat. The administration will also leave with an unfulfilled legacy on issues surrounding the transfer and use of cluster munitions and landmines. The United States still has not joined the vast majority of its allies and partners in signing the Convention on Cluster Munitions or the Mine Ban Treaty. Moreover, the United States continues to facilitate the use of cluster munitions, particularly in countries such as Yemen, where there have been numerous cases of U.S.-made cluster munitions hitting civilian targets. The United States has committed to phasing out by 2018 those cluster munitions with a failure rate exceeding 1 percent, which is an effort to mitigate the harm to civilians, and to prohibit nations buying U.S. cluster munitions from using them in civilian areas. Yet, progress has been slow and enforcement weak. The United States is one of only 35 countries that remain outside the Mine Ban Treaty, the 1997 accord also known as the Ottawa Convention. The Obama administration, in a policy shift two years ago, pledged essentially to comply with key treaty provisions, which bar the use, stockpiling, production, and transfer of anti-personnel landmines, everywhere except for the Korean peninsula due to the U.S. commitment to defend South Korea from a potential invasion from the North across the mined demilitarized zone. Numerous officials, however, have called this exception into question for more than a decade, noting that technological advances in other systems could offset the utility of landmines. Although the administration initiated a study to examine alternatives, the results of its study have yet to be released. On drones, the Obama administration has taken some steps toward establishing a transparent, accountable, and responsible policy for lethal use. In February 2015, the administration released an updated drone export policy, which includes potential requirements for enhanced end-use monitoring of military drones, additional security conditions, and requirements for only transferring sensitive systems through government-to-government military sales. Importantly, commercial U.S.-made drones are also subject to “stringent” restrictions under the new guidelines. The policy also requires recipients to agree to “principles for proper use” before an export can be approved. Additionally, in July the administration released the first official data regarding U.S. drone strike casualties. At the same time, the administration released an executive order on measures to address civilian casualties, which requires, among other steps, relevant agencies to develop, acquire, and field intelligence, surveillance, and reconnaissance systems that contribute to the protection of civilians and reduce the likelihood of civilian casualties. In August, the administration released a redacted version of the presidential policy guidance, which outlines the procedures for approving direct action against terrorist targets located outside the United States and areas of active hostilities. Although these are positive steps, U.S. drone policy overall continues to resemble a patchwork of half-measures to address concerns rather than a comprehensive and complete examination of how drone proliferation and use fit within larger strategic objectives. For example, although the civilian casualty data provides insight on combatant and noncombatant casualties in areas outside active hostilities, the release lacks substantive information to allow for objective analysis and more informed debate on the program’s overall effectiveness and risks to civilians. Ultimately, Obama’s record on conventional arms issues leaves much to be desired. After eight years in the White House, the administration missed its chance to better address the security, development, economic, and human impacts of the proliferation and use of conventional arms around the world. 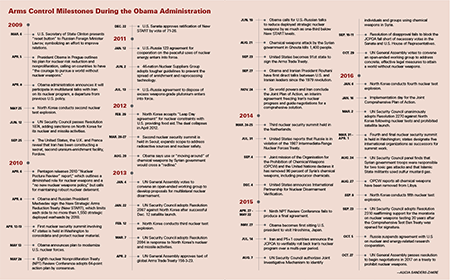 Although there were some commendable developments, Obama failed to make the most of opportunities to match U.S. global leadership in arms exports with performance as a global leader in setting appropriate standards for arms transfers and use. Rachel Stohl is a senior associate with the Stimson Center’s Managing Across Boundaries initiative and directs the center’s Conventional Defense program. March 6: U.S. Secretary of State Clinton presents “reset button” to Russian Foreign Minister Lavrov, symbolizing an effort to improve relations. April 8: Obama administration announces it will participate in multilateral talks with Iran on its nuclear program, a departure from previous U.S. policy. May 25: North Korea conducts second nuclear test explosion. June 12: UN Security Council passes Resolution 1874, adding sanctions on North Korea for its nuclear and missile activities. September 25: The United States, the U.K. and France reveal that Iran has been constructing a secret, second uranium-enrichment facility, Fordow. April 6: Pentagon releases 2010 “Nuclear Posture Review” report,” which outlines a diminished role for nuclear weapons and a “no new nuclear weapons policy,” but calls for maintaining robust nuclear deterrent. April 8: Obama and Russian President Medvedev sign the New Strategic Arms Reduction Treaty (New START), which limits each side to no more than 1,550 strategic deployed warheads by 2018. April 12-13: First nuclear security summit involving 47 states is held in Washington to consolidate and protect nuclear material. May 13: Obama announces plan to modernize U.S. nuclear forces. May 28: Eighth nuclear Nonproliferation Treaty (NPT) Review Conference adopts 64-point action plan by consensus. December 22: U.S. Senate approves ratification of New START by vote of 71-26. January 12: U.S.-Russia 123 agreement for cooperation on the peaceful uses of nuclear energy enters into force. June 2: 46-nation Nuclear Suppliers Group adopts tougher guidelines to prevent the spread of enrichment and reprocessing technology. July 13: U.S.-Russia agreement to dispose of excess weapons-grade plutonium enters into force. February 29: North Korea accepts “Leap Day agreement” for nuclear constraints with U.S. providing food aid. The deal collapses in April 2012. March 26-27: Second nuclear security summit is held in Seoul; expands scope to address radioactive sources and nuclear safety. January 4: UN General Assembly votes to convene an open-ended working group to develop proposals for multilateral nuclear disarmament. 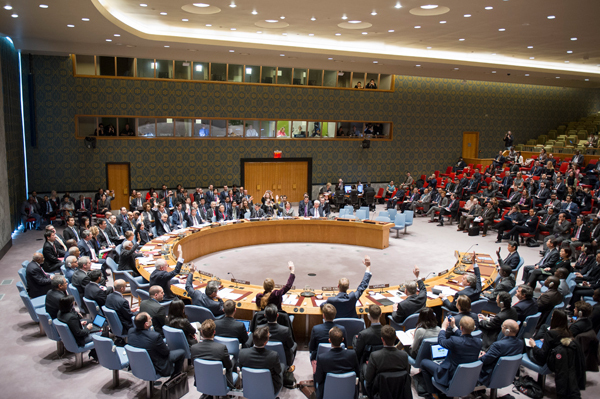 January 22: UN Security Council adopts Resolution 2087 against North Korea after successful Dec. 12 satellite launch. February 12: North Korea conducts third nuclear test explosion. March 7: UN Security Council adopts Resolution 2094 in response to North Korea’s nuclear and missile activities. April 2: UN General Assembly approves text of global Arms Trade Treaty 156-3-23. June 19: Obama calls for U.S.-Russian talks to reduce deployed strategic nuclear weapons by as much as one-third below New START levels. August 21: Chemical weapons attack by the Syrian government in Ghouta kills 1,400 people. 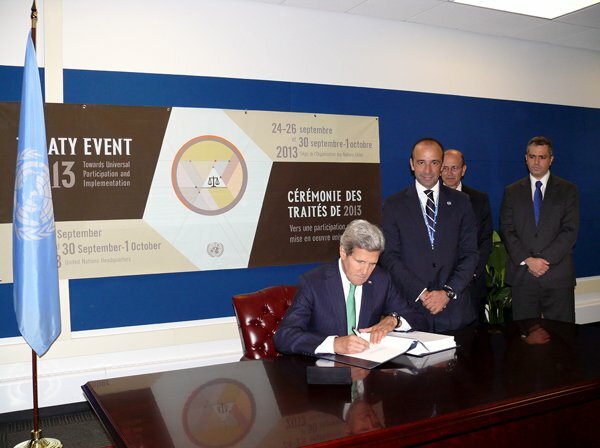 September 23: United States becomes 91st state to sign the Arms Trade Treaty. September 27: Obama and Iranian President Rouhani have first direct talks between U.S. and Iranian leaders since the 1979 revolution. November 24: Six world powers and Iran conclude the Joint Plan of Action, an interim agreement freezing Iran’s nuclear progress and guide negotiations for a comprehesive solution. March 24-25: Third nuclear security summit held in the Netherlands. July 31: United States reports that Russia is in violation of the 1987 Intermediate-Range Nuclear Forces Treaty. September 4: Joint mission of the Organisation for the Prohibition of Chemical Weapons (OPCW) and the United Nations declares it has removed 96 percent of Syria’s chemical weapons, including precursor chemicals. December 4: United States announces International Partnership for Nuclear Disarmament Verification. April 27 - May 22: Ninth NPT Review Conference fails to produce a final agreement. May 27: Obama becomes first sitting U.S. president to visit Hiroshima, Japan. July 14: Iran and P5+1 countries announce the JCPOA to verifiably roll back Iran’s nuclear program over a multi-year period. August 7: UN Security Council authorizes Joint Investigative Mechanism to identify individuals and groups using chemical weapons in Syria. September 10-11: Resolution of disapproval fails to block the JCPOA fall short of necessary votes in the Senate and U.S. House of Representatives. October 29: UN General Assembly votes to convene an open-ended working group to address concrete, effective legal measures to attain a world without nuclear weapons. January 6: North Korea conducts fourth nuclear test explosion. January 16: Implementation day for the Joint Comprehensive Plan of Action. March 2: UN Security Council unanimously adopts Resolution 2270 against North Korea following nuclear tests and prohibited satellite launch. March 31 - April 1: Fourth and final nuclear security summit is held in Washington; states designate five international organizations as successors for summit work. August 24: UN Security Council panel finds that Syrian government troops were responsible for two toxic gas attacks and that Islamic State militants used sulfur mustard gas. 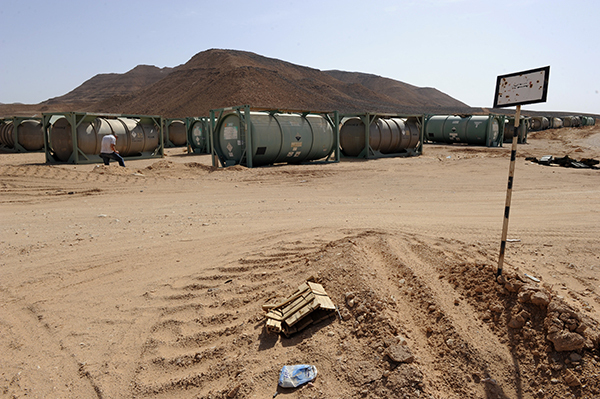 August 27: OPCW reports all chemical weapons have been removed from Libya. September 9: North Korea conducts fifth nuclear test explosion. September 23: UN Security Council adopts Resolution 2310 reaffirming support for the moratoria on nuclear weapons testing 20 years after the Comprehensive Test Ban Treaty was opened for signature. October 5: Russia suspends agreement with U.S on nuclear and energy-related research cooperation. October 27: UN General Assembly passes resolution to begin negotiations in 2017 on a treaty to prohibit nuclear weapons. The establishment of effective policies to counter proliferation financing will be key to ensuring the success of any strategy that seeks to reduce the threat from proliferating actors. When he departs the White House on January 20, President Barack Obama will leave behind for his successor Donald Trump a portfolio of proliferation challenges requiring early attention. Among them, North Korea will be a top priority, given its threatening posture and the accelerated pace of its missile and nuclear warhead development. Yet, to effectively address this and other proliferation threats, the new administration must also grapple with the underlying processes that facilitate them. One of these is international finance. Proliferators from former Pakistani nuclear official Abdul Qadeer Khan to the governments of Iran, North Korea, and Syria have used the formal financial system to facilitate their illicit procurement or sales. Without access to sufficient and moveable funds, determined proliferators are unlikely to obtain the sensitive goods and technology they seek. A robust U.S. approach toward countering proliferation finance (CPF) can deny proliferators access to the formal financial system and disrupt related illicit activities. The United States has been active with CPF efforts for many years, although the approaches taken have varied among administrations. Globally, the conversation is still in its infancy. Some structures, such as limited international obligations, have been put in place to further such efforts. Yet, proliferation financing remains poorly understood; and as a result, government initiatives to combat it are lacking. This carries ripple effects in the financial sector, where there is confusion as to what should be done to thwart proliferation financing and the best way to do it. Rectifying these issues is difficult but vital. The international framework surrounding CPF efforts has fallen increasingly out of touch with the reality of proliferation today. Almost counterintuitively, the nuclear agreement with Iran has made it more difficult for the United States to pursue an active discussion on the issue with other governments. The agreement has created the misleading impression that Iran no longer poses a proliferation threat, and the agencies within those governments responsible for countering financial crime no longer perceive proliferation finance as relevant to Iran. Many of those same countries also feel they are not exposed to risk from North Korea’s financial activities because they have not traditionally maintained close trade relationships with Pyongyang. Yet, large North Korean business networks continue to operate overseas, and case studies have shown repeatedly that the country is skilled in carrying out illicit procurement activities undetected around the world. Proliferation challenges will not be going away, and the establishment of effective policies to counter proliferation financing will be key to ensuring the success of any strategy that seeks to reduce the threat from proliferating actors. The new U.S. president will have to address the current concerns directly and make sure that the conversation on actions moves forward domestically and internationally. Together with its G-7 partners, the administration instead pursued a plan whereby proliferation financing would be classified as a financial crime risk and housed under the roof of the Financial Action Task Force (FATF), the international organization responsible for coordinating governmental responses to financial crime.7 The organization had already been successful in establishing anti-money laundering and counterterrorism financing obligations, and it was hoped that the same could be achieved for CPF issues. As these conversations with foreign governments took place, the administration devoted few resources to outreach and conversations with financial institutions, which would eventually be tasked to implement international obligations in practice. In many ways, it was too early for the administration to have such conversations with banks, as CPF concepts were still in their infancy on the international stage and most attention was overwhelmingly devoted to terrorism, including countering its financing. In the final months of the Bush administration, the FATF conducted exploratory research into actions that could be taken by countries to ensure that financial institutions operating under their jurisdictions complied with financial restrictions contained in UN Security Council resolutions related to Iran and North Korea. Its findings were compiled into an in-depth report on proliferation financing, which outlined the trends and tactics employed by proliferators to circumvent the controls of the financial system.8 Although this was an important step and the first time that proliferation finance had been devoted attention this exclusively, the task force did not manage to adopt formal CPF measures during the tenure of the U.S. administration that had initiated the discussion. The initiative was therefore left for Obama to take forward. Obama picked up where his predecessor left off in terms of the international CPF discussion, but made key changes in other parts of his approach. Particularly, in the first years of the Obama administration, officials not only wanted stronger obligations to comply with sanctions lists, but were also pressing for obligations to counter proliferation financing activity more generally. This would involve obligations on financial institutions to remain vigilant toward financial transactions that may not be connected to sanctioned individuals and entities but still have a connection to nuclear or missile proliferation activities. Not all governments shared the U.S. view that CPF obligations should be activity based rather than limited to sanctions lists only. There was a difference in views between the United States and European partners on this issue.12 Germany, in particular, worked against the United States on this point. It believed that financial institutions were not in a position to exercise a “general vigilance” against proliferation finance and that placing such additional due diligence measures would be bad for the country’s export community. These conflicting views meant that the agreed mandate within the FATF, although an important step, was much narrower than what Washington had originally envisioned. In 2012 the task force included the issue of CPF in its formal recommendations, focusing only on the implementation of list-based financial sanctions at the UN level.13 Countries would only be required to implement UN targeted financial sanctions relating to proliferation, covering Iran and North Korea at the time. Because UN Security Council resolutions form international law already, this did not create any new obligation on FATF members. Because it only covered targeted sanctions, it also excluded UN Security Council Resolution 1540 and its proliferation finance requirements. There are three problems with this narrower definition, which the new U.S. president must address. First, the recommendation has done little to alter the practices of financial institutions, most of whom have expressed the view that they were already implementing targeted financial sanctions internally without help from governments.14 Banks employ software programs that screen all incoming and outgoing transactions against sanctions lists in order to flag transactions that involve sanctioned entities. On the whole, financial institutions believe they are already countering proliferation finance by focusing on sanctions alone. The obligation established at the FATF level has done little else than merely reconfirming it as one of the practices that may be employed to counter proliferation finance. This illuminates a second, practical issue: proliferation finance as an activity goes beyond UN lists of sanctioned entities and individuals. The UN sanctions list for North Korea, for instance, includes 28 individuals and 32 entities, far fewer than are actually engaged in Pyongyang’s proliferation endeavors.15 Proliferators such as North Korea employ various deceptive practices to circumvent such basic scrutiny as sanctions screening software. They almost always use front companies and larger networks to conceal the involvement of designated entities, which will rarely appear on trade or financial documentation after they are sanctioned. Focusing on sanctioned parties at the exclusion of an activity-based understanding of proliferation dramatically weakens overall CPF efforts. Third, the proliferation financing landscape has developed significantly since the FATF recommendations on CPF issues were concluded, to the extent that the recommendations have been rendered largely irrelevant. Iran, previously covered under the recommendations, is no longer subject to nuclear-related targeted financial sanctions at the UN level and therefore is assumed by some to be no longer within the scope of the FATF recommendations. In the case of North Korea, UN financial sanctions have moved beyond list-based sanctions. For example, financial restrictions now include the banning of correspondent banking relationships with North Korean financial institutions and mandates the closing of overseas branches of North Korean banks.16 The international standards within the FATF thus lag behind the current reality of counterproliferation regimes and are in desperate need of updating to reflect the new reality. Little has happened since the inclusion of the topic of CPF in the FATF recommendations in 2012. The United States appears no longer to be advocating for further measures within the FATF, and as a result, the focus on CPF issues within the organization has leveled off. It has not released any CPF guidance since 2013, and a number of other financial crime concerns, such as terrorism financing, are currently prioritized over proliferation finance. Instead, the Obama administration has pursued stronger actions to counter proliferation finance at the UN level, where recent resolutions on North Korea have included stringent financial restrictions,17 and at the national level. The administration has consistently supported the tough application of national sanctions on proliferators and their supporting networks. That approach began with Iran and has accelerated dramatically with respect to North Korea as the Iran approach was perceived to have “worked.” The United States introduced secondary sanctions on Iran in 2010, a measure allowing officials to sanction non-U.S. and non-Iranian financial institutions for conducting business with individuals and entities in Iran, thus furthering the reach of U.S. obligations beyond its national borders. If a European financial institution was found to be providing financial services in support of Iran’s nuclear and missile activities, the administration had the powers to remove that institution’s access to the U.S. financial system. Common to all such unilateral measures has been the slow move away from focusing specifically on sanctioned nuclear and missile activities and a move toward focusing on a range of trade with a particular country. The administration, after pursuing this more comprehensive approach to counter proliferation finance, has therefore broadened the scope of initiatives domestically and internationally. This blurring of the definition of CPF and what it entails has caused some confusion. Interviews with financial institutions around the world reveal that U.S. authorities on one hand maintain high expectations on financial institutions and believe that these institutions should be capable of implementing measures to counter proliferation finance activity. The administration has backed up this perception by pursuing a policy of penalizing international financial institutions for their past transgressions. The Obama administration has overseen fines of up to $8.9 billion brought against international banks that illegally processed transactions connected to Iran through the U.S. financial system. The fines have served to instill a general fear among international financial institutions of being caught up in the U.S. sanctions web to the extent that many now pay more attention to U.S. regulators than to their own home governments. On the other hand, such expectations have not been reinforced with guidance on the specific measures that financial institutions can adopt. Any formal outreach and communication with banks is focused on sanctions implementation and not efforts to counter proliferation finance. The result is a private sector overly focused on implementing list-based financial sanctions, relating to specific countries, entities, or individuals, rather than proliferation finance activity more generally. When it comes to engagement with other governments, the Obama administration has continued its outreach activities to countries particularly exposed to threats resulting from proliferation financing, such as in Southeast Asia. In this way, it has ensured that the conversation on the need to counter proliferation finance is continuing in those jurisdictions. What the administration has not done is to further promote activity-based measures, and as a result, many countries have not devoted much thinking to CPF activities beyond mandated sanctions implementation. Furthermore, although some countries have been motivated to cooperate with the United States on CPF issues because of the fear of being on the wrong side of U.S. sanctions, others perceive the aggressive use of sanctions by the United States as overly wide-ranging and have become less inclined to cooperate for that reason. It is therefore crucial that the new U.S. president pursue measures to make CPF efforts truly international rather than what is currently perceived by many as overreach of U.S. sanctions regimes. A question facing the new U.S. administration is whether to return to the FATF and pursue a stronger set of CPF recommendations within that forum. The lessons learned from previous administrations will come in useful. The process for affecting change within the FATF is often slow, and the consensus reached is often at the lowest common denominator. Should the administration still want to revive U.S. advocacy to counter proliferation finance within the FATF, it should consider whether it wishes to push for an update to the formal recommendations to make sure these are brought current with the reality of recent sanctions regimes. It should also ensure that resources are devoted to the issuance of specific guidance to countries and financial institutions and bring onboard other governments that may be susceptible to supporting this effort. Second is the question whether the administration should restore its advocacy of an activity-based discussion on CPF issues. In the latter years of the Obama administration, U.S. efforts to counter proliferation finance appear to have moved away from this discussion, instead focusing on deterring financial institutions from engaging with entire jurisdictions rather than specific proliferation-specific activities. The new administration will need to determine whether it wishes to continue this policy to deter general business relationships on a whole range of activities or to refocus efforts to define proliferation finance activities as those that may be carried out by any actor at any time. Finally, the incoming administration will need to consider its outreach strategy to financial institutions and governments. Financial institutions are the ones processing payments that may potentially support proliferation activities, and it is crucial that they are given the guidance and tools necessary to detect and stop such transactions. It is also important that they are aware of exactly what is expected of them. Although these expectations should be informed by national governments, the conversation is currently led globally by U.S. expectations. Given that the conversation on CPF is still only in its infancy at the global level, it therefore falls to the United States to engage in more active conversations in order to create a self-sustaining CPF effort in other jurisdictions. These questions will be difficult to address, but they are vital to ensuring that proliferators will not be able to access the formal financial system to support their illicit procurement activities. All of the gaps and challenges ahead also require international partnership in order to work. The United States cannot be perceived as going alone on this issue because doing so would be counterproductive and ill received. It would be counterproductive because it runs the risk of foreign governments disengaging from the issue, due to the impression that the United States will cover the education, monitoring, and implementation of CPF efforts globally. It would be ill received because many countries already see U.S. measures as overreach, and a furthering of this sentiment could cause some governments to see CPF efforts as a policy only relevant to the United States and its allies. The United States cannot dominate such conversations, and it is important that an international norm is developed around CPF so that others may follow suit. As outlined above, the Bush administration recognized the need for CPF issues to be treated internationally in their own right. The Obama administration continued this effort and successfully oversaw the inclusion of CPF topics in the FATF recommendations while expanding unilateral measures against proliferating actors. It will be up to Trump’s national security team to make sure that CPF efforts are maintained as a priority on the global counterproliferation and arms control agenda and that obligations are pursued in a way that ensures a focus on CPF at an activity level. Deceptive practices of proliferators evolve in response to new sanctions designations, and it is important that initiatives to counter proliferation financing at an activity level are restarted. The United States will need to push for international standards that acknowledge this and ensure that counter proliferation finance efforts remain a global agenda item, not just a U.S. one. 1. Michael Laufer, “A.Q. Khan Nuclear Chronology,” Carnegie Endowment for International Peace, September 7, 2005, http://carnegieendowment.org/2005/09/07/a.-q.-khan-nuclear-chronology. 2. UN Security Council, S/RES/1540, April 28, 2004. 3. UN Security Council Resolution 1737 froze the assets of designated individuals and entities connected to Iran’s nuclear program and installed bans on certain sensitive goods and materials. Resolution 1718 froze the assets of designated individuals and entities connected to North Korea’s nuclear program, imposed an arms embargo, and installed bans on sensitive technology. 4. Interviews conducted by author. 5. WikiLeaks, “Public Library of U.S. Diplomacy: French Conference on WMD Proliferation Financing,” June 27, 2006, https://wikileaks.org/plusd/cables/06PARIS4443_a.html. 6. WikiLeaks, “Public Library of U.S. Diplomacy: (S/NF) G7 Conference on WMD Proliferation Financing,” November 7, 2006, https://wikileaks.org/plusd/cables/06PARIS7269_a.html. 8. Financial Action Task Force (FATF), “Proliferation Financing Report,” June 18, 2008, http://www.fatf-gafi.org/media/fatf/documents/reports/Typologies%20Report%20on%20Proliferation%20Financing.pdf. 9. WikiLeaks, “Public Library of U.S. Diplomacy: U.S.-EU Nonproliferation Consultations,” August 11, 2009, https://wikileaks.org/plusd/cables/09STATE83574_a.html. 10. WikiLeaks, “Public Library of U.S. Diplomacy: National Coordinated Measures Meeting with EU4, May 14, 2009,” June 8, 2009, https://wikileaks.org/plusd/cables/09STATE58742_a.html. 11. WikiLeaks, “Public Library of U.S. Diplomacy: Treasury A/S Cohen Raises Iran, North Korea, Taliban With UAE Central Bank Governor,” August 4, 2009, https://wikileaks.org/plusd/cables/09ABUDHABI783_a.html. 12. Interviews conducted by author. 13. FATF, “International Standards on Combating Money Laundering and the Financing of Terrorism and Proliferation: The FATF Recommendations,” February 2012, http://www.fatf-gafi.org/media/fatf/documents/recommendations/pdfs/FATF_Recommendations.pdf. 14. Interviews conducted by author. 15. UN 1718 Sanctions Committee (DPRK), “Sanctions List Materials,” March 2, 2016, https://www.un.org/sc/suborg/en/sanctions/1718/materials. 16. UN Security Council, S/RES/2270, March 2, 2016. 17. UN Security Council Resolution 2270 enforced new measures to terminate financial relationships with North Korean banks located overseas and included restrictions on proliferation finance activity more generally. 18. Hamish Macdonald, “U.S. Lists North Korea as Money Launderer, Imposes Financial Strictures,” NK News, June 1 2016, https://www.nknews.org/2016/06/u-s-lists-north-korea-as-money-launderer-imposes-financial-strictures/. 19. U.S. Department of the Treasury, “Treasury Takes Actions to Further Restrict North Korea’s Access to the U.S. Financial System,” June 1, 2016, https://www.treasury.gov/press-center/press-releases/Pages/jl0471.aspx. Emil Dall is a research analyst in the Proliferation and Nuclear Policy program at the Royal United Services Institute, where he focuses on nuclear and missile proliferation networks, proliferation financing, and sanctions policy. Trump has made a range of comments about how, if elected, he would approach the July 2015 nuclear deal that the United States and its P5+1 partners (China, France, Germany, Russia, and the United Kingdom) negotiated with Iran. In a March 21 speech to the American Israel Public Affairs Committee, an influential pro-Israel group, Trump said his “number one priority is to dismantle the disastrous deal with Iran.” He has also described the agreement as the worst deal ever negotiated and said he would seek to renegotiate it. The agreement, which has been in force since January, limits Iran’s nuclear activities and subjects the program to intrusive monitoring. In exchange, Iran received relief from nuclear-related sanctions imposed by the United States, European Union, and UN Security Council. Trump has not provided any details on how he would renegotiate the deal, an effort that European allies have already signaled they will resist. The UN Security Council endorsed the agreement in Resolution 2231, which was passed unanimously in July 2015. Maj. Gen. Yahya Rahim Safavi, a military aide to Iranian Supreme Leader Ali Khamenei reportedly told state television on Nov. 15 that it would be a “strategic mistake” for Trump to pull out of the Iran deal. Safavi noted that presidential candidates often make statements while campaigning that do not reflect their positions in office. Although the deal is a multilateral agreement, Trump could decide to unilaterally pull out of the agreement or stop implementing U.S. commitments. Under the terms of the deal, U.S. sanctions relief comes from presidential waivers during the initial years of the agreement. Trump, as president, will need to periodically reissue those waivers to continue sanctions relief. The passage of the additional nuclear-related sanctions by the United States would violate Washington’s commitments under the agreement. In personnel announcements Nov. 18, Trump selected vocal Iran-deal opponents to fill two key national security posts. 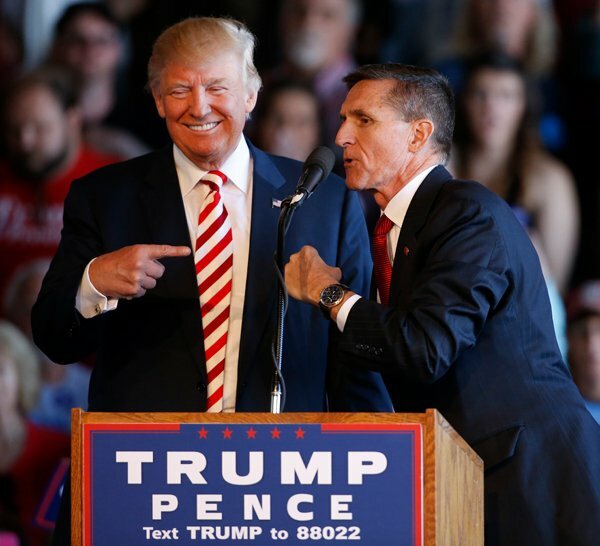 He named retired Lt. Gen. Michael Flynn, a former director of the U.S. Defense Intelligence Agency, to be his national security adviser and Rep. Mike Pompeo (R-Kan.), a member of the House Intelligence Committee and a tea party favorite who graduated from the U.S. Military Academy at West Point, to head the CIA. “I look forward to rolling back this disastrous deal with the world’s largest state sponsor of terrorism,” Pompeo wrote on Twitter a day before the announcements. If Trump does decide to take action to dismantle the Iran agreement, he may face opposition from members of Congress who initially opposed the agreement. Senate Foreign Relations Committee Chairman Bob Corker (R-Tenn.) told MSNBC on Nov. 16 that the agreement should not be discarded immediately and that “the beginning point is for us to cause them to strictly adhere” to the deal. Corker opposed the agreement during the congressional review of the deal last year. Both opponents and supporters of the deal acknowledged the critical role that international support for sanctions played in pressuring Iran to return to negotiations over its nuclear program. Mogherini made clear that if the United States leaves the agreement, she will continue working to implement it. Nicholas Burns, who was U.S. undersecretary of state for political affairs from 2005 to 2008, said that efforts by Trump to reimpose sanctions or kill the deal would poison relations with key nations. “It would be an act of diplomatic suicide by the United States,” he said Nov. 10 at an Asian Society forum in New York. The International Atomic Energy Agency’s (IAEA) quarterly report on Iranian compliance with the conditions set out under the nuclear deal noted that Tehran slightly exceeded the heavy-water stockpile limit of 130 metric tons. 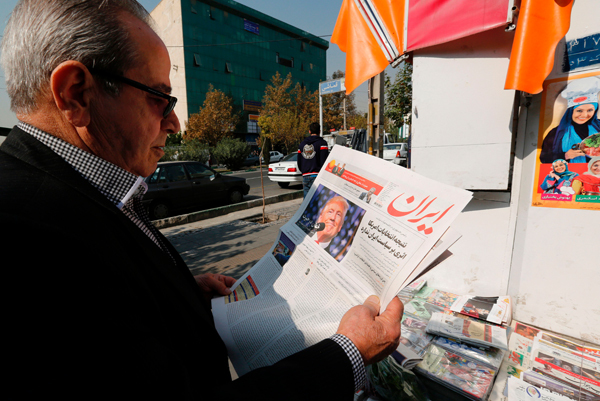 The report said that Iran had 130.1 metric tons on Nov. 8. Under the terms of the agreement, Iran can continue heavy-water production, which is used as a moderator in some nuclear reactors, and store up to 130 metric tons of the material. Iran can sell any excess. The IAEA report said that Iran notified the agency of its intention to ship out five metric tons in a letter dated Nov. 9. The concern about heavy water, which contains an isotope of hydrogen called deuterium, reflects the fact that it can be used as a moderator for reactors that are particularly well suited for producing weapons-grade plutonium. Iran was building a heavy-water reactor at Arak that would have produced enough weapons-grade plutonium annually for about two nuclear warheads, but that reactor is being modified as part of the deal. It will now produce negligible amounts of weapons-grade plutonium and ship out all of the spent reactor fuel. Prior to Iran exceeding the limit, IAEA Director-General Yukiya Amano expressed concern about Iran’s stockpile of heavy water after inspectors noted on Oct. 25 that Tehran had exactly 130 metric tons. At the agency’s Board of Governors meeting Nov. 17, Amano urged that Iran strictly comply with the Joint Comprehensive Plan of Action (JCPOA), the nuclear accord’s formal name. “It is important that such situations should be avoided in the future in order to maintain international confidence in the implementation of the JCPOA, which represents a clear gain for nuclear verification in Iran,” he said. Reza Najafi, Iranian ambassador to the IAEA, pushed back against describing the excess heavy water as a breach of the deal’s limits. He told reporters at the IAEA on Nov. 17 that the text of deal says that Iran’s heavy-water needs are “estimated” to be 130 metric tons and that does not create a clear limit for the stockpile size. On Nov. 20, state-owned Press TV quoted a spokesman for the Atomic Energy Organization of Iran as saying that Iran had transferred an unspecified quantity of heavy water to Oman and that more would be sent there in the future. This is the second time that Iran has exceeded the heavy-water limit. The IAEA quarterly report in February noted that Tehran had 130.9 metric tons. Since that excess was reported, Iran had sold heavy water to the United States and Russia to remain under the limit. A supermajority of UN member states is set to begin negotiations early next year on a treaty to prohibit nuclear weapons amid uncertainty. A supermajority of UN member states is set to begin negotiations early next year on a treaty to prohibit nuclear weapons amid uncertainty about how long the talks will last; the content of the new instrument, as well as other legal and technical issues; and how many states that rely on nuclear deterrence for their security will participate. 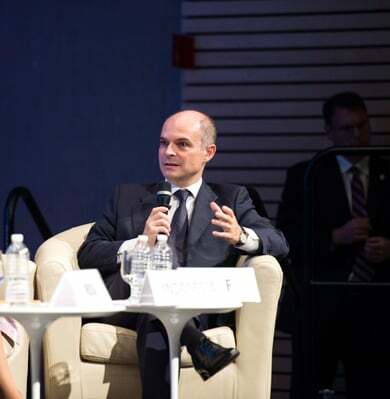 Jorge Lomónaco, the permanent representative of Mexico to the UN and other international organizations in Geneva, told the attendees at the 2016 EU Non-Proliferation and Disarmament Conference on Nov. 3 that he “was pleasantly surprised at the level of support to the resolution.” Mexico co-sponsored the resolution with Austria, Brazil, Ireland, Nigeria, and South Africa. The push to begin negotiations on a ban treaty reflects growing concern among non-nuclear-weapon states about the devastating humanitarian consequences of any use of nuclear weapons, the rising risks of conflict between states with nuclear weapons, and frustration at the slow pace of nuclear disarmament by the nine nuclear-armed countries. The resolution calls for a one-day organizational meeting to be held in New York “as soon as possible,” followed by two negotiating sessions, March 27-31 and June 15-July 7. “Creating this lasting legal norm might take more time than the four weeks foreseen in 2017,” he added. A major initial hurdle is the lack of consensus on what the treaty should prohibit. The final report of an open-ended working group that met in Geneva this year and served as the basis for the First Committee resolution suggested 21 notional elements that could be contained in a new instrument. (See ACT, September 2016.) These include prohibitions in the categories of acquisition and possession, use or the threat of use, development and production, deployment, visitation and transit, fissile material production, and military cooperation with another nuclear-armed state. Participating states may also seek to address other technical and legal issues not mentioned in the working group report, such as procedures for accession to the treaty and enforcement measures. If the negotiations cannot be concluded in four weeks, it remains to be seen whether the participants will seek a mandate to continue the talks at next year’s UN General Assembly. The First Committee approved the resolution despite aggressive lobbying by nuclear-armed powers France, Russia, the United Kingdom, and the United States, which opposed the measure and have said they will not participate in such treaty negotiations. As a group, however, the nuclear-armed nations were divided on the resolution. Thomas Countryman, the acting U.S. undersecretary of state for arms control and international security, said at the Nov. 3 EU conference that the United States opposes the commencement of talks to ban nuclear weapons because the process would not help move disarmament efforts forward. He said that the United States would instead “continue to invest [its] energy” in more practical and realistic approaches, such as addressing the growing North Korean nuclear threat, pushing for negotiations on a treaty to halt the production of fissile material, ratifying the Comprehensive Test Ban Treaty, and pursuing further nuclear weapons reductions and improving strategic stability. In an unexpected move, China abstained on the resolution, making it the lone permanent member of the UN Security Council not to oppose the measure. Other nuclear-armed states took varied positions. India and Pakistan abstained, North Korea voted yes, and Israel, which does not officially acknowledge having nuclear weapons, voted no. In an Oct. 28 statement explaining India’s vote, D.B. Venkatesh Varma, permanent representative of India to the CD, said India is “not convinced” that the proposed negotiations in 2017 “can address the longstanding expectation of the international community for a comprehensive instrument on nuclear disarmament.” India has yet to say whether it will participate in the negotiations on a ban treaty. The resolution was opposed by nearly every U.S. treaty ally in Europe and Asia, often labeled “umbrella states” because they rely on the U.S. nuclear arsenal to help protect them. The sole exception was the Netherlands, which abstained. Dutch Foreign Minister Bert Koenders said after the vote that the Netherlands “sincerely supports a ban on nuclear weapons” but that there were problems with the resolution, according to Dutch broadcaster NOS. The lower house of the Dutch parliament had pressed the government to support the resolution. The Netherlands is planning to participate in the negotiations next year, according to a Nov. 17 message on Twitter from the International Campaign to Abolish Nuclear Weapons. Meanwhile, although Japan voted against the resolution, Japanese Foreign Minister Fumio Kishida said at an Oct. 28 press conference that he believes Japan should take part in the talks. Hellmut Lagos, alternate representative of Chile to the CD, told the EU conference that the “voting patterns” on the resolution “are extremely interesting.” He said that he expected that “many countries that abstained or even voted against” the resolution “will consider” participating. 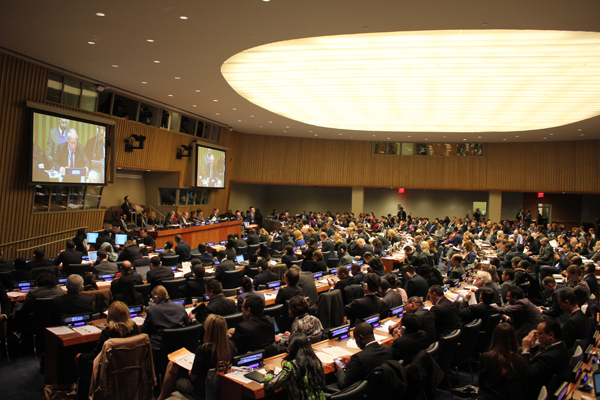 In its 2016 session, the UN General Assembly First Committee adopted resolutions on nuclear disarmament beyond the measure mandating the beginning of negotiations on a treaty to prohibit nuclear weapons. Below are some of those resolutions. Reaffirms that use of nuclear weapons would be a “crime against humanity” and requests that the Conference on Disarmament (CD) commence negotiations on a treaty prohibiting the use or threat of use of nuclear weapons. Adopted by a vote of 128-50 with eight abstentions. France, the United Kingdom, and the United States opposed the resolution. China and India voted in favor, and Russia abstained. Stresses the “vital importance” of signing and ratifying the Comprehensive Test Ban Treaty to ensure its early entry into force. “Strongly condemns” the January and September 2016 nuclear tests by North Korea. Adopted by a vote of 183-1 with four abstentions. North Korea opposed the resolution. Equatorial Guinea, India, Mauritius, and Syria abstained. Urges the CD to commence negotiations on a treaty banning the production of fissile material for nuclear weapons. Requests the secretary-general establish a fissile material cutoff treaty expert preparatory group to report to the UN General Assembly at its 73rd session in 2018. Adopted by a vote of 177-1 with 10 abstentions. Pakistan opposed the resolution. China and Russia abstained. France, the UK, and the United States voted in favor of the resolution. Stresses the “catastrophic effects of a nuclear weapons detonation” that include “deep implications for human survival, for the environment, for socioeconomic development, for our economies and for the health of future generations.” Calls on all states to prevent the proliferation and use of nuclear weapons. Adopted by a vote of 143-16 with 24 abstentions. China abstained. France, Russia, the UK, and the United States opposed the resolution. Urges all states-parties to the nuclear Nonproliferation Treaty to renew their commitment to their obligations under Article VI and to pursue an additional legal instrument to prohibit and eliminate nuclear weapons. Approved by a vote of 135-33 with 14 abstentions. China abstained. France, Russia, the UK, and the United States voted against the resolution. Declares that nuclear weapons are “inherently immoral” and that their use violates international law and the “dictates of public conscience.” Stresses that all states have an “ethical responsibility” to work toward the elimination of nuclear weapons. Adopted by a vote of 131-36 with 17 abstentions. China abstained. France, Russia, the UK, and the United States voted against the resolution. Encourages nuclear-weapon states and non-nuclear-weapon states to “further engage in meaningful dialogue that facilitates practical and concrete measures on nuclear disarmament and nonproliferation” and encourages Russia and the United States to begin negotiations on further nuclear reductions. Calls on all states to prevent nuclear proliferation. Adopted by a vote of 167-4 with 17 abstentions. China, North Korea, Russia, and Syria voted against the resolution. France and the UK abstained. The United States voted in favor. Urges all parties to take practical steps toward the establishment of a nuclear-weapon-free zone in the Middle East and calls on all countries to place their nuclear activities under International Atomic Energy Agency safeguards. Adopted without a vote.